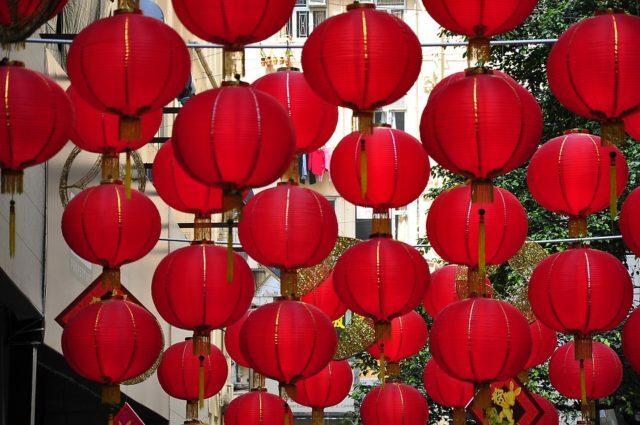 Ang Bao or red packets are traditional gifts given among friends and family every Chinese New Year. Chinese tradition favours cash incentives as gifts rather than other material presents. 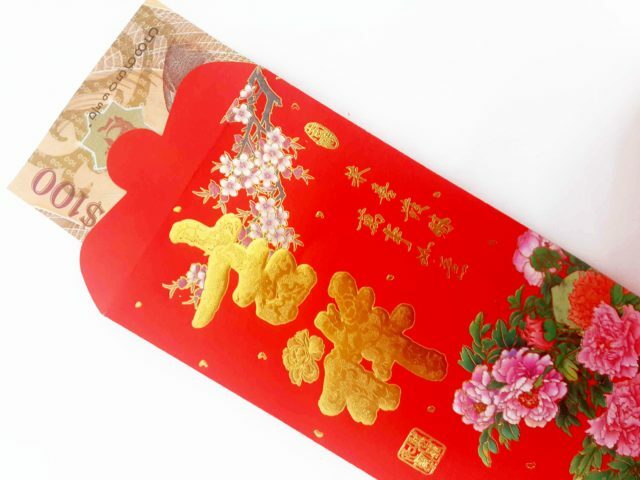 These monetary gifts are packed into red envelopes, with red being the colour of good luck and prosperity. 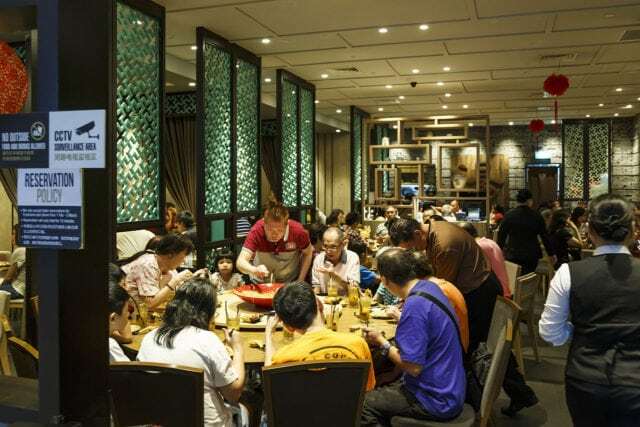 Ang Baos are usually given at family gatherings, and children are particularly excited about receiving them. 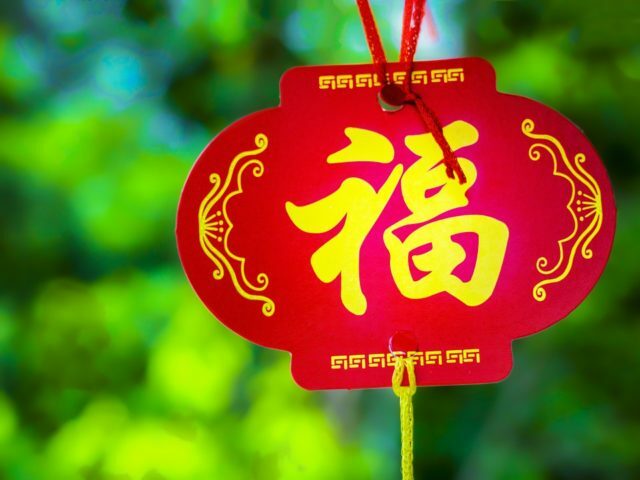 There are certain do’s and don’ts related to the giving and receiving of Ang Bao so let’s take a look at the common practices. For starters, the And Bao should never be presented in a white envelope, as this is the traditional colour of mourning. In the past, only red packets were used. However, modern Ang Bao packets come in a variety of bright colours including pink, yellow and gold. In actual fact, the amount of money shouldn’t be all that important and you shouldn’t feel pressured to give out red packets. 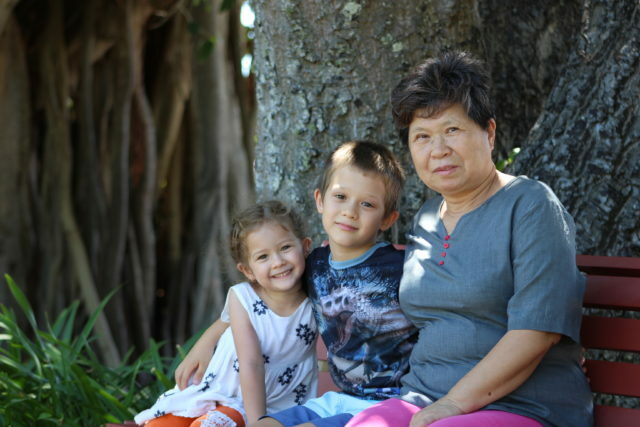 Chinese New Year is about the celebration of family and friends. As long as you are giving ang bao with the right intention, any amount will do. Give out from your heart and the gift will be meaningful. The rates stated here are merely suggestions. You should feel free to adjust them according to your own budget. Before you decide on how much to give, it is important to know what digits to avoid. In Chinese tradition, the number 4 sounds like the word ‘death‘ and considered a symbol of bad luck. Therefore, any amount beginning or ending with 4 is expressly avoided. This means that you shouldn’t give $4, $14, $40 or $44 Ang Baos. 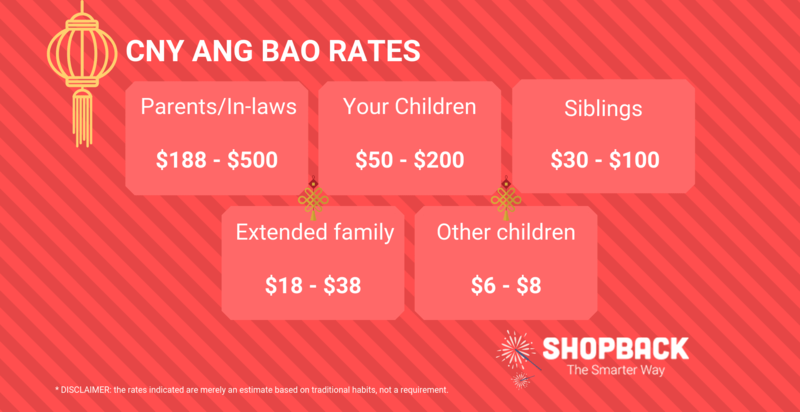 Ang Bao rates are usually given in even numbers. Even numbers are thought to be more ’rounded’ and wholesome, conveying your wishes for a stable and more complete life for your loved ones. Also, any amount with the number 8 in it is also considered auspicious. Usually, only married people give out Ang Baos as they’re considered to be ‘adults’ in ancient China. However, an increasing number of singletons are breaking with tradition and decide to be generous. This is of course due to the fact that income isn’t tied to marital status anymore and almost everyone is financially independent in this day and age. If you’re single, you should check with your family members if they’re okay with you giving as some older, more conservative folks may hold on to the ancient way of doing things. 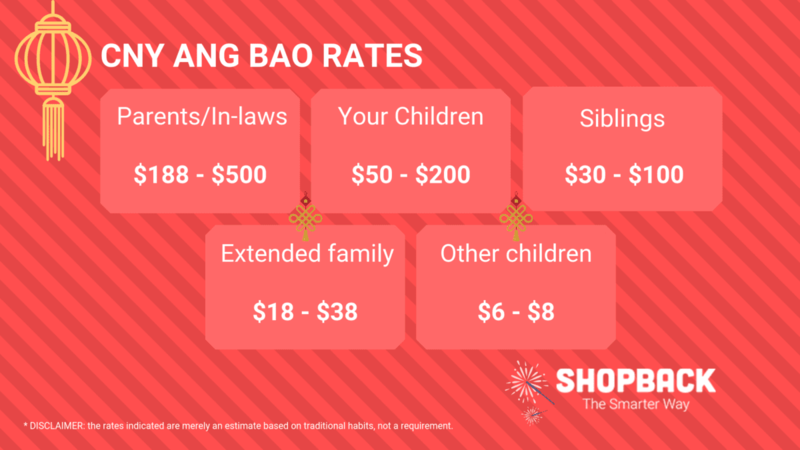 In general, the Ang Baos with the highest cash amount are reserved for those closest to you, which includes your parents, in-laws, spouse, and children. Next come your extended family members like cousins, nephews, and nieces. Usually, Ang Baos are only given to the children of friends who come to visit during festivities. This means that it’s not the usual practice for adult friends to exchange Ang Baos unless they’re super close. Instead, adults who visit each other would usually bring gifts like Mandarin oranges, liquor, and chocolates. People usually reserve their biggest Ang Bao for their parents. A good amount would fall between $188 – $500. This token sum is a symbol of filial piety and gratitude for their efforts raising you up and spending money supporting your education and growing up years. Parents usually give their children about $50 -$200 as a sign of parental love. 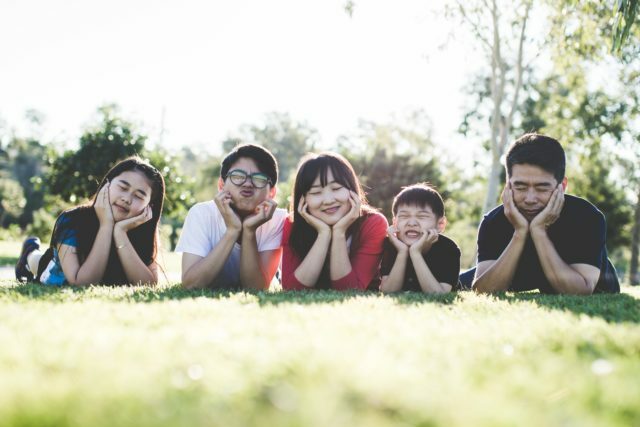 In the past, when demonstrations of love like hugging, kissing and cuddling were rare in Chinese households, this was a chance for parents to express their emotions to their kids. The amount given to siblings depends on how many siblings you have. A safe amount would be between $30 – $100. Aunts, uncles, nephews, nieces, and cousins fall into this category. A nice amount can fall anywhere between $18 to $38, depending on how close you are to them. If you’re particularly close to an unrelated child for some reason, you may consider bumping them up to the ‘ extended family’ section. Otherwise, random children who come to your house should be thankful to get anything between $6 to $8. It is a healthy practice to show appreciation to the cleaners, sanitation workers, bus drivers, guards and maintenance workers that you come into contact with on a daily basis. Usually, a token of between $5 to $10 will let them know you appreciate their work throughout the year. 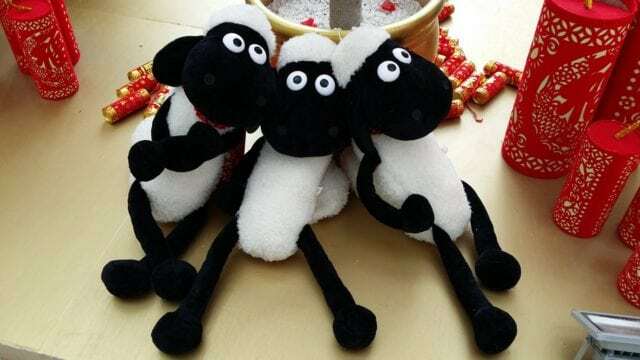 As Chinese New Year draws near, don’t forget to start preparing early. Get your shiny new notes for the red packets, prepare the ang baos for the family and start celebrating. 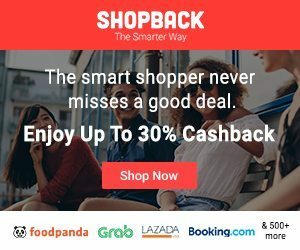 Get your shopping done in time and make the best use of all the CNY deals from an ASOS discount code to a Zalora promo code and many more. The more cashback you get, the more you will save to offer Ang Bao packets. * Originally published on 11 Jan 2018, updated on 23 Jan 2019. Festive Chinese New Year Outfit Ideas That Aren't Red!